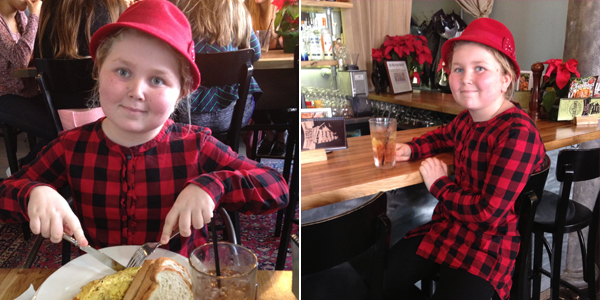 Looking for somewhere to take the kids for a bite of lunch over the holidays? Who’s going to give you a more honest, bite-sized review than a 12-year-old? Our Junior Restaurant Critic, Eliza Olander, is a student at The Centre for Creative Learning in Hamilton and lives in St David’s. I come here quite a lot and I always feel very welcome. Sometimes it’s the same waitress — I know the people here. And I know the food is going to be delicious. It’s very rustic but also modern. It reminds me of a sandwich shop in Boston; a hidden away place I went to with Mommy where I popped in and I could smell the food getting cooked and the fresh bread and the logo of the restaurant was on the window. Devil’s Isle reminds me of that. It makes me very happy to see a place like that here in Bermuda. It’s very fruity, not too sour, an equal amount of sweet and sour and it tastes fresh. Sometimes when I get an Italian soda it taste like syrup that comes out of a bottle but this doesn’t. On a scale of 1-10 it’s a 9. Fruity, nice and cold, refreshing. I love the ham. I also love the mixed berry jam; it’s not too sweet and has that sour taste to it. I like that you can feel the seeds as sometimes they are taken out of jam but this makes it taste fresh. The cheese could have been a little stronger for me but it’s still very good. They caramelized the onions but I would have liked them even sweeter. The eggs are cooked perfectly but the ham is the best feature of the omelette. It’s delicious. When the fig jam touches your tongue it’s sweet and then it has a very smoky flavour to it, which is lovely. It almost tastes like apple sauce, which I love. I like it that the jams aren’t heavy; sometimes they can be like Jell-O but these aren’t. It’s quick. The waitress [Teresa Rivero] was friendly and I see her all the time. I was here one time with my sister Pansy and she noticed that the waitress spoke Spanish so we spoke to her in Spanish. She is a very kind person. The omelette was perfect, a great size for me. I always feel very happy when I come here because I know I will always get a fantastic meal. The food is modern and fresh and satisfying. They should probably sell the jam for customers to take out. It’s on a busy street and sometimes I stop by to get a hot chocolate on my way to school. It’s a very convenient location. Great review! Keep them coming! nice job kid. Keep it up! Well done young lady! ¡Muy bien! It’s not a soda like Coke, it’s a little fruit syrup mixed with sparkling water. I love her reviews! And I love watching her palate develop over the years, she really pays attention to what she is eating and is becoming more and more discerning. I love her reviews always look forward to them! She’s so cute! I just want to grab those cheeks.